Below are results from the 2012/2014 U.S. PIAAC Household Studies from adults ages 16 to 65 in the U.S. and 21 other countries1 in literacy, numeracy, and problem-solving in technology-rich environments. View and print a copy of the PIAAC First Look Report. View and download a copy of the Commissioner's Statement and presentation of results. View, download, and print additional results with standard errors from the 2012/2014 PIAAC assessment by various sample groups and variables at the PIAAC Interactive Data Portal. 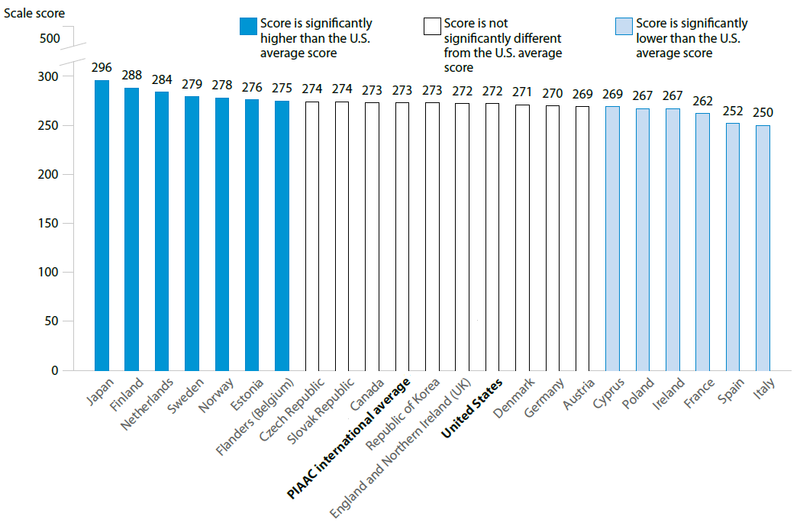 How Do Adults in the United States Compare on the PIAAC Literacy Scale to Their Peers in Other Countries/Regions? SOURCE: U.S. Department of Education, National Center for Education Statistics, Program for the International Assessment of Adult Competencies (PIAAC), U.S. PIAAC 2012/2014; Organization for Economic Cooperation and Development, PIAAC 2012. Have Adults in the United States Made Progress in Literacy? On the literacy scale, the average score for adults age 16 to 65 in the United States on the PIAAC (2012/14) was significantly higher than the score on ALL (2003-08) but was not significantly different than the score on IALS (1994-98). 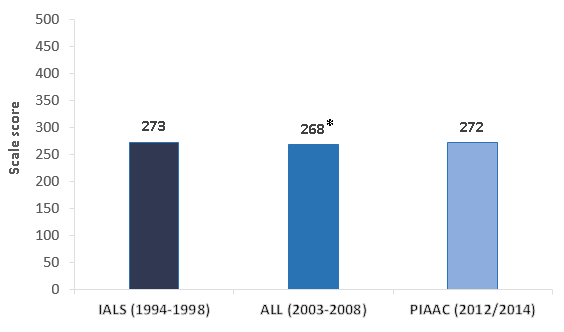 * Significantly different (p < .05) from PIAAC 2012/14. SOURCE: U.S. Department of Education, National Center for Education Statistics, Statistics Canada and Organization for Economic Cooperation and Development (OECD), International Adult Literacy Survey (IALS), 1994-98; Adult Literacy and Lifeskills Survey (ALL), 2003-08; and Program for the International Assessment of Adult Competencies (PIAAC), U.S. PIAAC 2012/2014. 1 Data from Australia are not shown due to national restrictions on the use of their data.